TCOPR handled the media coverage of renowned hot dog purveyor “Hot Dog Mike” Juiliano as he broke the world record for most expensive hot dog with his new invention: theONEdog, a quarter-pound premium all beef hot dog topped with lobster tail, saffron aioli and gold flakes. 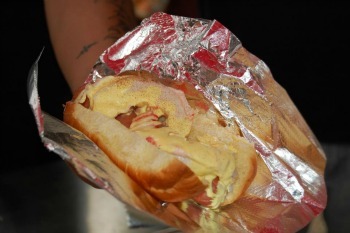 TheONEdog was sold for $1,501 to “The World’s Most Expensive Hot Dog Buyers” willing to taste the collaboration of ground beef and gold flakes. Juiliano donated $1,500 from the sale of each hot dog to The One, Inc., a homeless advocacy nonprofit. The proceeds will benefit local homeless outreach.